How Many People Use Steroids? Steroids are prescribed to stimulate muscle growth, induce puberty in males or increase appetite. However, athletes abuse them to enhance performance. Effects of steroids include increase in lean body mass, decrease in fat mass and enhanced strength. Over time, steroids can cause a number of gender-related health effects as well as psychological effects. People can become dependent on steroids to avoid unpleasant withdrawal symptoms and for their performance-enhancing effects. Overdose is not likely with steroids. But people who abuse them for a long time put themselves at risk for serious health problems. Rates of steroid abuse among high school seniors appear to be increasing. Football players and wrestlers are the most common users. Synthetic anabolic steroids are manufactured pharmaceutical substances that resemble the body’s own steroid hormones, including testosterone. They are most commonly prescribed to stimulate the growth of muscles, increase appetite, induce puberty in males or treat chronic wasting conditions, such as cancer or AIDS. People may abuse steroids to stimulate lean muscle mass production, build strength and decrease exercise recovery time.1, 2 Athletes most commonly misuse steroids as a way to enhance performance or prolong endurance. For this reason, anabolic steroids are prohibited from both collegiate and professional sports. Though steroids do not produce the same “high” as other abused drugs, they have been shown to be habit-forming. Continued anabolic steroid use can lead to both physical and psychological dependence. 12-step recovery: Meet and discuss your addiction with other people struggling with drug abuse. A sponsor helps you complete the twelve steps to achieve a life free of steroid use. Inpatient or residential drug treatment: Stay at a rehabilitation center while going through a substance abuse treatment program. The process generally includes intake, detox, group and individual addiction therapy and aftercare or follow-up care. Outpatient rehabilitation drug treatment: Visit a rehab facility several times a week for group or individual therapy to help you work through the issues around your addiction. Outpatient programs may also provide detox. It’s good to be well-informed about the treatment process for steroids and factors that can affect your experience before you set foot in a rehab program. Think about what type of treatment is the best fit for your situation and your addiction. For example, how much do you want your family involved in your care? Do you want to attend a program in a nice location, like near the beach? Are you able to take time away from home and work? Whether it offers high-end features in addition to rehabilitation services. Whether it’s a 30-day, 60-day or 90-day program. Whether it’s an inpatient or outpatient program (inpatient tends to cost more but provides a higher level of care). How much your insurance covers. If you need help finding out what your insurance will cover, or you don’t have insurance, choose one of the options below. If you have insurance. You can call to learn more about what your insurance will cover and your treatment options. If you don’t have insurance. Contact the Substance Abuse and Mental Health Services Administration’s helpline for referrals to local rehab programs that serve people without insurance. People who use steroids repeatedly or at doses higher than the recommended amount are abusing the drug. People who take the drug in a different manner than what was prescribed are misusing the drug. Those who abuse steroids may take doses 10 to 100 times greater than what is recommended. Some people who abuse steroids may “stack” the drug.2 They will take 2 or more types of steroids at once to enhance the effects of the drug and allow them to get bigger more rapidly. Pyramiding the drug may occur in cycles of 6 to 12 weeks. The user will take lower doses of the drug at first, and then gradually increase to higher doses over time. During the second half of the cycle, the individual will titrate their dose back down again to help prevent unwanted side effects. Overdose is unlikely with steroids. But someone who abuses steroids over a long period of time places themselves at risk for dangerous, if not deadly, health effects (see next section). Increase in lean body mass. Continuous misuse of steroids can lead to a number of gender-specific effects. Yellowing of the skin and whites of the eyes–a sign of steroid-induced jaundice. 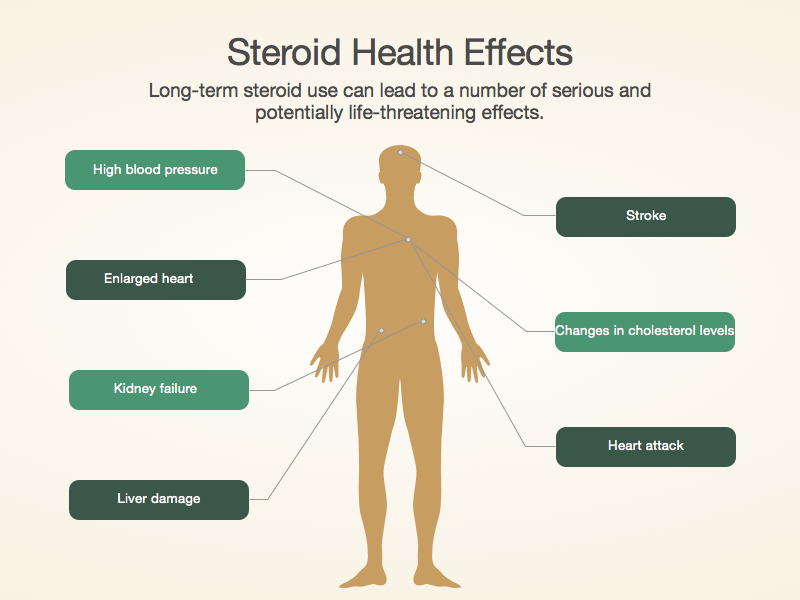 Long-term use of steroids can have extremely harmful effects. For instance, consistent use will reduce the body’s responsiveness to the drug, which is known as tolerance. Additionally, continuous use of anabolic steroids may trigger the body to stop producing its own testosterone.3 Due to these effects, many people who abuse steroids will often take “drug holidays,” or breaks from taking the medication. They may also take several different types of steroids to maximize their effectiveness and reduce their body’s dependence on the drug. Long-term use of steroids will influence neural activity, as well as certain neurotransmitter systems–which, in turn, may have an impact on mood and behavior. Feeling of invincibility, causing impaired judgment. Kidney damage and kidney failure. These symptoms make recovery from the addiction very difficult. People who are dependent on steroids may require supportive medical treatments and even pharmaceutical interventions to treat their addiction. Tolerance, or a need for larger amounts to achieve the desired effect. Taking steroids to avoid withdrawal symptoms. Taking shorter “off periods” than intended or stopping “off periods” altogether. Anxiety associated with steroid cessation and subsequent inability to quit or cut down. Excessive amount of time spent acquiring and using steroids as well as muscle-building activities such as weight lifting or supplement use. Abandoning other hobbies for fear of missing workouts or disrupting diet. Continuing to use steroids despite physical or psychological problems. Abnormal amount of lipids in the blood. Cardiomyopathy (thickening of the heart muscle). Many steroid users have body image problems. It’s important to note that when seeking treatment for a steroid addiction, a mental health disorder could be present as well. Using steroids can be quite reinforcing due to the effects on performance and endurance, and this increases the risk for developing an addiction. People may continue to use steroids despite having a number of physical problems or even negative impacts on their social relationships. Additionally, people who are addicted to the drug will spend exorbitant amounts of money to obtain it. Steroid use has become an increasingly serious public health concern. About 3.3% of people in the world have used steroids, with men being 6 times more likely than women to use these drugs.9 Recreational athletes are more likely to use steroids than professional athletes, and the rate of use is highest in the Middle East. A 2013 survey found that approximately 3.2% of students nationwide had taken steroids illegally and that males were more likely than females to use them. Steroid abuse among students increased significantly from 1991-2001 then decreased from 2001-2013. In one study,24.7% of teenagers who had used steroids had shared needles in the past 30 days. This increases the risk for HIV, hepatitis and other infectious diseases. 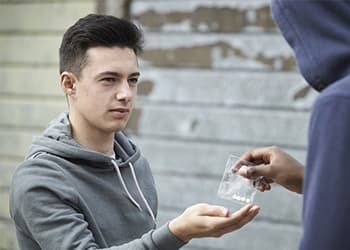 The same study revealed that the more often the teenagers used steroids, the more likely they were to abuse other drugs (cocaine, marijuana, smokeless tobacco). They were less likely to abuse alcohol or cigarettes. Lack of knowledge about health risks. If you or someone you love is struggling with steroid abuse or addiction, call 1-888-319-2606 Who Answers? to speak with a treatment support representative about recovery options.
. Mottram DR, George AJ. (2000). Anabolic steroids. Endocrinol Metabolism 14:55-69.
. Bahrke MS, Yesalis CE. (2004). Abuse of anabolic and androgenic steroids and related substances in sport and exercise. Current Opinion in Pharmacology 4:614-620.
. Shahidi NT. (2001). A review of the chemistry, biological action, and clinical applications of anabolic-androgenic steroids. Clinical Therapeutics 23:1355-1390.
. American Psychiatric Association. (2013). Diagnostic and Statistical Manual of Mental Disorders, 5th ed. Arlington, VA, American Psychiatric Publishing.
. Sagoe, D. (2014). Methods Used in a Meta-Analysis and Meta-Regression Analysis of the Global Epidemiology of Anabolic-Androgenic Steroid Use. SAGE Research Methods Cases 24(5): 383-398. doi:10.1016/j.annepidem.2014.01.009.
. Pope, H., Wood, R., Rogol, A., Nyberg, F., Bowers, L., & Bhasin, S. (2014). Adverse Health Consequences of Performance-Enhancing Drugs: An Endocrine Society Scientific Statement. Endocrine Reviews 35(3): 341-375. doi:10.1210/er.2013-1058.
. Buckman, J., Farris, S., & Yusko, D. (2013). A national study of substance use behaviors among NCAA male athletes who use banned performance enhancing substances. Drug and Alcohol Dependence 131(1-2): 50-55. doi:10.1016/j.drugalcdep.2013.04.023.
. Brower, K.J., Blow F.C., Young P.J. et al. (1991). Symptoms and correlates of anabolic-androgenic steroid dependence. BR J Addict 86: 759-768.